Presidential executive orders are basically the same powers any CEO has for managing his/her company. Before the "New deal" and the first 158 years of this nation presidential executive orders had very little effect on private enterprise or normal civilian life at all. That is because very few people depended on the government for hardly anything. Now, government is driving the economy and damn near everything else, what a pity. PS: THE GREAT USA IS GREAT BECAUSE IN THE PAST IT WAS ALWAYS RULED BY LAW, NOT IDEOLOGY, EMOTIONALISM, CONSERVATISM, LIBERALISM ETC. GOD HELP US. The fact is this writer can dissect and understands the inner workings of an economy as well as anyone. I have concluded that the USA culture, morals, and economy all are on a course toward total doom. It is so frustrating to me that no matter how long I keep drum beating and flailing away sounding the primal alarm stress call that repealing the arch-evil 1938 socialist minimum wage law will reset our course toward that "Shinning city up on the hill". 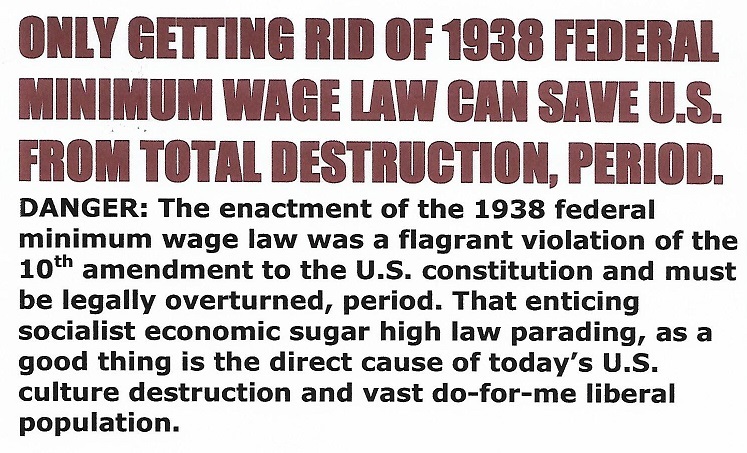 All the USA need to do is simply repeal the 1938 socialist minimum wage law, the republicans now has the "Trifecta power" that I have long written about, but I'm afraid they totally disagree with getting rid of this arch-evil law. But, I assure you if the republicans don't go for the jugular and repeal this arch-evil law while they have the power, nothing can stop the liberal from making the USA an authoritarian failed socialist state, period. However, if the republicans repeal this evil law it will untie our binded USA economy and a genuine true free market place economy will kick in. The untied USA economy will slowly purge and bring into balance the cost of living staple foods and medical prices so they can't get above what the poor can pay out of pocket. The reason why prices and the cost of living are so out of sight is because government subsiding won't let the prices come down. By government giving money to the poor and needy on an individual basis means the merchant is not forced to keep prices down lower enough for the working poor in order to stay in business. If government is going to pay the poor on an individual basis it should be done with stamps that can only be spent in a government commissary, clinic, of housing unit only. Otherwise it is impossible for the USA economy to survive much longer. There is no mystery here, an economy just simply have too many variables, but like mother nature a genuine true free market place without a hog tying minimum wage law will keep everything in balance and save the USA. However, like nature has a birth and death cycle, an economy has a normal natural boom and bust cycle to get rid of moral decay, culture rot, and anything else that is getting out of balance. SIRMANS LOG: 31 JANUARY 2017, 1803 HOURS. Knowing something as simple as where do practically all government income and wealth originate from, I doubt more than 5 percent of the U.S. population can give the correct answer. You will get answers like all kinds of taxes, licenses, fees, tariffs, or whatever, which all will be wrong. Right answer: Practically all of government income and wealth originates from some form of private U.S. business profit, period. It's like a small kid thinking all butter and eggs originates from the grocery store. Dwindling private U.S. business profit is why the USA is 20,000,000,000,000 in debt; U.S. businesses simply don't generate nearly enough profit to support our ever-growing bloated welfare state, period. And you are going to convince me that the USA economy is not going to soon totally collapse, duh. SIRMANS LOG: 31 JANUARY 2017, 1111 HOURS.